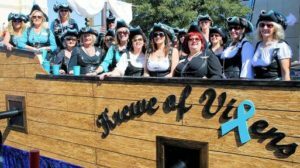 Krewe of Vixens (KOV) is a non-profit organization (Krewe) dedicated to providing financial, emotional, and educational support services of individuals with Ovarian Cancer. We support women of all ages, in all stages of Ovarian Cancer, along with their caregivers, offering knowledge, encouragement and friendship..
With your support, KOV will help fund the best and most promising Ovarian Cancer research efforts while supporting women and their loved ones affected by the disease in our quest to end this terrible disease. Currently, we are going into our third year, 2016-2017 and are now 35 members strong, after starting with 22 lovely Vixens in our inaugural year! We will be accepting 15 new members for 2017. 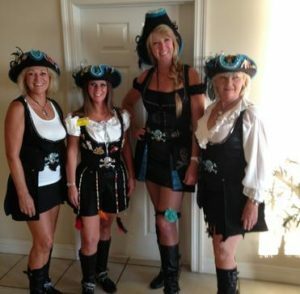 Our Krewe is by invitation only, however, if you are interested in joining, please send us an email introducing yourself and expressing your interest in becoming a Vixen. We would love to meet like-minded ladies and may one day, open the Krewe to all. It all started with an idea to start a Mardi Gras Krewe, but we wanted to do more than just Mardi Gras. So, the idea became stronger and larger with “Helping stop the number one killer of women of all ages – Ovarian Cancer”. Below are our current Board of Directors. Thank you for all your hard work.